We are a yogini climber and a climber that sometimes yogas. Contact us to schedule a bouldering, hiking, or yoga tour at Hueco Tanks State Park! 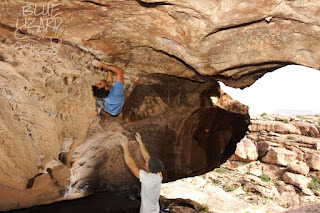 ...two type-A PhD overachievers quit their science jobs and move to Hueco Tanks to guide? Follow us and find out! It's been a while since our last post...finishing up with work has been pretty busy and a lot has happened! We started Insanity. I told my boss I'm quitting (Beth has a one-year head start on me). We got to the recovery week of Insanity and both of us got sick. We quit Insanity again. We settled on a logo! 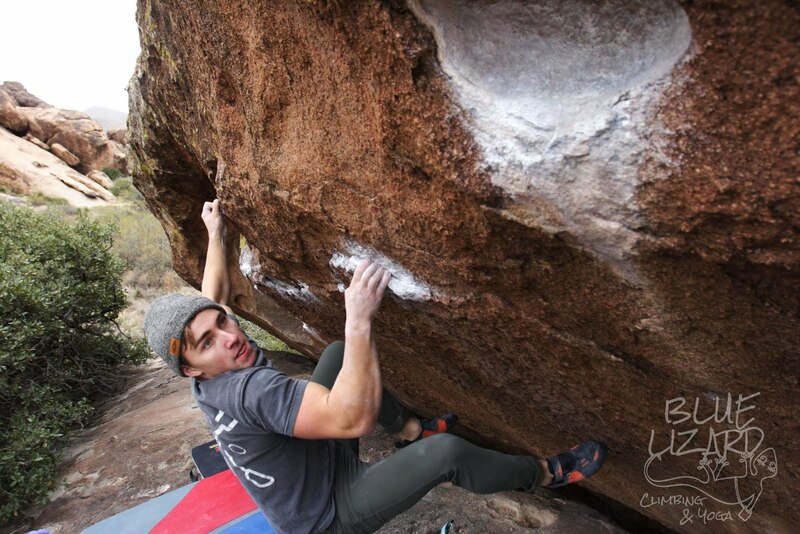 We went to Hueco Tanksgiving with Kat, Sundev, Austin and Nicole, and had a blast, even with the rain! But I tweaked my pinky tendon. Both of us have been recovering and packing and prepping for this move. Austin Sarles on Animal Acts, Hueco Tanksgiving 2015. Sundev Lohr on Dry Heaves, Hueco Tanksgiving 2015. One of the saddest parts of our move has been taking down our garage climbing wall. We haven't really used it in about a year, but it was still sad to take down! Tomorrow is going to be a big day for us, we will be moving all of our cats to El Paso! Wish us luck! And hopefully you'll participate in some of our adventures soon! Most photos copyright (c) Marek Photography. Simple theme. Powered by Blogger.